The patented Multistage Evaporative Cooling System (MECS) will cool the inlet air entering natural gas combustion turbines (CTs) to <= 59°F in most climatic regions, thereby cost effectively increasing CT efficiencies and resulting power production by 5 to 25 percent while using less energy. The primary reason Turbine Inlet Cooling (TIC) is implemented is to enhance the power output of natural gas combustionturbines (CTs) when the outside ambient air temperature is above 59°F. The International Standards Organization (ISO) rated capacities of all CTs are based on the standard outside ambient air conditions of 59°F at 14.7 psia (sea level). For example, TIC industry data shows that cooling the outside ambient inlet air from 100°F to 59°F prevents the loss of 27 percent of the rated generation capacity. MECS is scalable from 10 to over 3000 tons. Delivers 57°F cool water, 53°F cold air, or both at the same time based on ASHRAE tables for Phoenix summer design conditions for cooling applications. Has comparable first costs to mechanical refrigeration systems. Provides 60 to 85 percent less power usage/more energy savings compared to traditional mechanical refrigeration systems. Incorporates NO compressors and uses NO refrigerants. What is the effect of Air Intake on Compressor performance? The effect of intake air on compressor performance should not be underestimated. Intake air that is contaminated or hot can impair compressor performance and result in excess energy and maintenance costs. If moisture, dust, or other contaminants are present in the intake air, such contaminants can build up on the internal components of the compressor, such as valves, impellers, rotors, and vanes. Such build-up can cause premature wear and reduce compressor capacity. 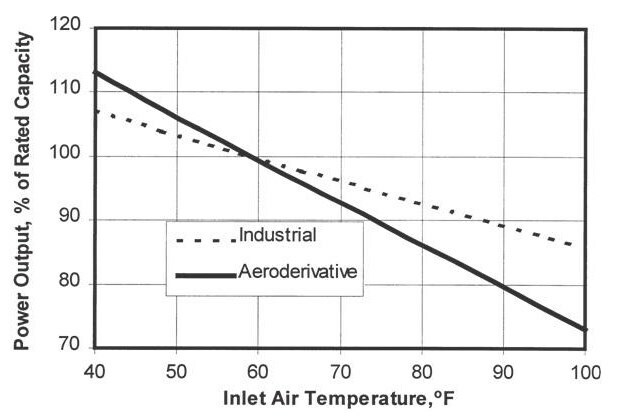 When inlet air is cooler, it is also denser. As a result, mass flow and pressure capability increase with decreasing intake air temperatures, particularly in centrifugal compressors. This mass flow increase effect is less pronounced for lubricant-injected, rotary-screw compressors because the incoming air mixes with the higher temperature lubricant. Conversely, as the temperature of intake air increases, the air density decreases and mass flow and pressure capability decrease. The resulting reduction in capacity is often addressed by operating additional compressors, thus increasing energy consumption. Rules of thumb in designing Compressed Air Systems. Every 7°F rise in temperature of intake air will result in 1% rise in energy consumption. Compressor discharge temperatures are a key indicator of compression efficiency. Uncooled compressed air is hot, as much as 250 to 350 deg F! Most water-cooled after coolers will require about 3 GPM per 100 CFM of compressed air at Discharge Air Temperature at 100 psig and will produce about 20 gallons of condensate per day. Locate filters and a dryer in the airline before any pressure-reducing valve (i.e., at the highest pressure) and after air is cooled to 100°F or less (the lowest temperature). Many tools require more CFM at 90 PSI than what is physically possible to get from the power available through a 120 VAC outlet. Beware, that the CFM figure given as the required air power on many tools (e.g., air chisels/hammers, sandblasters) is for an absurdly low duty cycle. You just can’t run these constantly on anything but a monster compressor, but the manufacturer still wants you to believe you can, so you will buy the tool. Depending on the size of the system, compressed air costs about 25 to 42 cents per thousand cubic feet of free air ingested by the compressor (including operating and maintenance costs). A 50 horsepower compressor rejects approximately 126,000 BTU per hour for heat recovery. The water vapor content at ~100° F of saturated compressed air is about two gallons per hour for each 100 CFM of compressor capacity. Every ~20°F temperature drop in saturated compressed air at constant pressure, 50% of the water vapor condenses to liquid or at 100 psig every ~20°F increase in saturated air temperature doubles the amount of moisture in the air. Every 2-psig change in pressure equals 1% change in horsepower. Most air motors require 30 CFM at 90 psig per horsepower. For every 10” water gauge pressure lost at the inlet, the compressor performance is reduced by 2%. Intake filters should be regularly cleaned well before dirt causes significant pressure restrictions. A device, which will satisfactorily perform its function with 50 psig of air pressure, uses approximately 75% more compressed air when it is operated with compressed air at 100 psig. As a general rule, for every 100 kPa reduction in operating pressure results in about 8% energy and cost savings. ASHRAE published Summer Design Conditions of .4% for cooling applications – For Inlet Air Cooling for Nat Gas Turbines/CHP Systems and Compressed Air Systems, cold supply air temperatures provided to inlet of the combustion turbine can be maintained at an air temperature of 54.80 °F. No compressors and refrigerants are used in the system. Based on the Monthly Mean Dry Bulb and Wet Bulb Temperatures – For Inlet Air Cooling for Nat Gas Turbines/CHP Systems and Compressed Air Systems, cold supply air temperatures provided to inlet of the combustion turbine can be maintained at an air temperature of 67.10 °F in the hottest month of August. No compressors and refrigerants are used in the system. Significantly lower cold air supply temperatures of between 52.10 °F and 62.10 °F can be maintained by adding dehumidification to the MU AHU. ASHRAE published Summer Design Conditions of .4% for cooling applications – For Inlet Air Cooling for Nat Gas Turbines/CHP Systems and Compressed Air Systems, cold supply air temperatures provided to inlet of the combustion turbine can be maintained at an air temperature of 73.20 °F. No compressors and refrigerants are used in the system. Based on the Monthly Mean Dry Bulb and Wet Bulb Temperatures – For Inlet Air Cooling for Nat Gas Turbines/CHP Systems and Compressed Air Systems, cold supply air temperatures provided to inlet of the combustion turbine can be maintained at an air temperature of 70.10 °F in the hottest month of August. No compressors and refrigerants are used in the system. Significantly lower cold air supply temperatures of between 55.10 °F and 65.10 °F can be maintained by adding dehumidification to the MU AHU. ASHRAE published Summer Design Conditions of .4% for cooling applications – For Inlet Air Cooling for Nat Gas Turbines/CHP Systems and Compressed Air Systems, cold supply air temperatures provided to inlet of the combustion turbine can be maintained at an air temperature of 73.70 °F. No compressors and refrigerants are used in the system. Based on the Monthly Mean Dry Bulb and Wet Bulb Temperatures – For Inlet Air Cooling for Nat Gas Turbines/CHP Systems and Compressed Air Systems, cold supply air temperatures provided to inlet of the combustion turbine can be maintained at an air temperature of 77.40 °F in the hottest month of August. No compressors and refrigerants are used in the system. Significantly lower cold air supply temperatures of between 62.40 °F and 72.40 °F can be maintained by adding dehumidification to the MU AHU. ASHRAE published Summer Design Conditions of .4% for cooling applications – For Inlet Air Cooling for Nat Gas Turbines/CHP Systems and Compressed Air Systems, cold supply air temperatures provided to inlet of the combustion turbine can be maintained at an air temperature of 58.60 °F. No compressors and refrigerants are used in the system. Based on the Monthly Mean Dry Bulb and Wet Bulb Temperatures – For Inlet Air Cooling for Nat Gas Turbines/CHP Systems and Compressed Air Systems, cold supply air temperatures provided to inlet of the combustion turbine can be maintained at an air temperature of 63.80 °F in the hottest month of August. No compressors and refrigerants are used in the system. Significantly lower cold air supply temperatures of between 48.80 °F and 58.60 °F can be maintained by adding dehumidification to the MU AHU.